Is there such a thing as "no touch" brass polish/cleaner? I got a brass O gauge box car at a show recently. Its tarnished and has patina - lots of patina. I would like it to be shiny brass once again so it can be sprayed with clear coat and remain shiny brass colored. There are way too many tiny details on it to use a traditional brass polish which must be rubbed and then dug out of the corners/cracks/crevices, so I am looking for a spray on, or dip-type of cleaner. These "no touch" cleaners are available for silver, but I am no chemist. 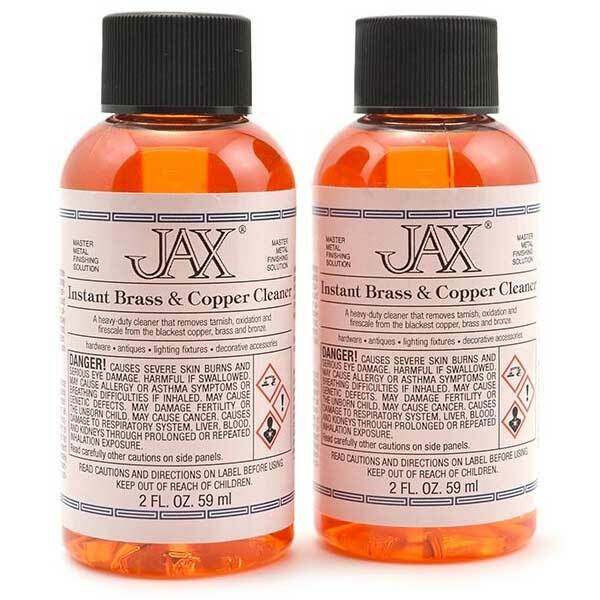 So are dip-type cleaners/polishes available for brass? If so, what are their brand names? Before posting, I looked at Flitz and read the reviews on Amazon. The reviews were less that stellar. Dilute Glacial acetic acid ~50%; immerse for 15-20 min. A soft brushing may be necessary to remove heavier tarnish. Rinse 3-8 times with pure alcohol. Air dry and paint or clear coat. JAX makes a dip type tarnish remover. I have not used this one yet. Available from Micro Mark. I used to use LONCOTERGE CU3 but its NLA. A word of caution. I don't usually get involved with these things but, if the model has any clear coat remaining it will need to be removed first. The clear coat will likely act like a barrier and the only areas that will be chemically cleaned will be the areas with no clear coat. There are commercial cleaners/brighteners (Brite Dip is one) that will do exactly what you want but, unless you know someone in the industry, it's almost impossible to obtain. Good reason for that...very hazardous to the untrained and poorly equipped. Martin's suggestion is best if you don't have a clear coat. I have one PSC Pullman with clear coat, and nothing will touch it - not even good grade paint remover. But here's an interim thing to try: Barkeepers Friend, right next to the Bab-O on the grocery store shelf. Make a poultice of that and water. A toothbrush will help. I use it on my scratchbuilds, and afterwards often paint. So far no problems. I do a very light bead blast when I can, but trying that on an import can be hazardous due to warping. paint would be my suggestion, too. it's easier to remove fresh paint than to clean up a tarnished brass surface and who knows, you might get it right the first time. a poorly painted brass model is usually a horror, but a nicely finished brass car, painted and decaled, enhances its appearance IMO. ...frankly, i'd prefer a light weathering, too. I've used Barkeepers Friend liquid spray version on items prior to painting, worked well. Try liquid ammonia as a dip. Brass & ammonia don't like each other and should clean up the tarnish. That is what is in BRASSO. I would start with weak solution and make it stronger if necessary. Have ventilation because of the ammonia. Brasso did not have ammonia before the 1990s or so. It was an excellent brass polish. When they changed the formula it became almost useless. There are now far better polishes - they come in tubes, and are a pink paste. Flitz is one of them. Expensive! But all require elbow grease, which is what the op wants to avoid. As usual, there are paint finish rections to consider too. Test out of sight. Clear lacquer is going to be thinnest, flattest, least noticable if you do it. ..most likely to react with present paint if you get sloppy too. Polishes, stiff & soft toothbrushs, paint brushes (natural & synth), and stiffer, cheap "toss-away" tin-tube handled glue/flux brushes are part of my detail corner & crevass clean up arsenal. Brasso and the Barkeeper's Friend products are about the best polishes. Wax works well to protect too. Floor wax, car wax, bee's wax...hardly matters. Final cleanings leaving metal "too clean"; "dry", is seldom as good as "a bit oily ". Ammonia based sprays belongs on glass and appliance enamel, or for grease/oil stripping, imo; that's it. It dries the heck out pastic by attacking it's oils...if not now, over time. I think one of the most highly guarded secrets in the world is how brass model mfrs chemically clean their brass to a shine before clearcoating. Even more highly guarded than the Dio-Sol formula which was outed a few years ago. A little googling shows that glacial acetic acid is available in small quantities; the first page had some for $26.95. Brite Dip seems to only be available in 55 gallon drums/carboy quantities. Jax is available from Micro Mark for 17 bucks. The finish would be ideal for painting but the etched surface would have to be polished if you wanted to clear coat it. FYI Dio Sol is mostly xylenes. Dio Sol is mostly xylenes. I used to use 6M HCl for ~5 min. Rinse with water until neutral; rinse with acetone until all water was gone; dried under Nitrogen/Argon in a zip lock bag until I was ready to paint. I knew you would save me the trouble of having it analyzed. Not that I need any as I still have a quart but what about the last two items? Non specific to say the least. A friend just picked up a couple dozen bottles of the original formula paint unopened. From the point of view of having restored antique cars which had both brass trim items and silvered lamp reflectors, I often found an obliging jeweler who would clean these items with an ultrasonic cleaner. Has anyone tried this? When I've made up my own I've substituted hexanes and toluene for Aromatic Hydrocarbon Solvent 5-10% & Light Aromatic Hydrocarbon 40-45%. Not recommended for those that are not comfortable using organic solvents or lacking the ventilation facilities. This is WAY more complicated than I ever thought it would be, but I said I was not a chemist. Thanks for the continuing information, though. That brings up another question. The vessel used to submerge or at least set the boxcar in should be made of... glass? Stainless steel? Aluminum? Pottery? The vessel used to submerge or at least set the boxcar in should be made of... glass? Stainless steel? The Flitz didn't do much, but the Jax did the trick. Then I flushed it with water, dried it in the sun and clear coated it with Aervoe clear engine enamel. Looked pretty good. The Twinkle worked well on my Revere ware sauce pans.